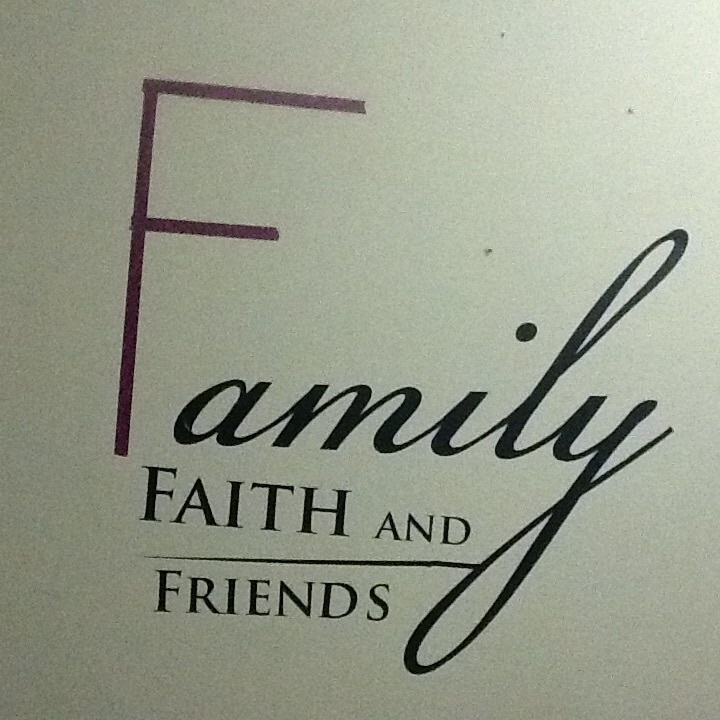 As a member of CWA Review Crew I was honored to be given the opportunity to review Divine Walls crafts inspirational and faith-based vinyl wall art. My first impression of this product was how efficiently it was shipped. It arrived in a cardboard tube with the vinyl wall art rolled up without wrinkles, along with an instruction sheet about how to apply it to the wall. I read the instructions and thought that there has to be an easier way to apply it. I disregarded the instructions, partly due to the fact that I didn’t fully understand how to complete them. It could also have been a result of being under general anesthesia Tuesday for an out-patient surgery. I have noticed the logical side of my brain is a bit foggy. I pulled the backing off and completely messed up one of the letters. I improvised and used some decorative tape I had on hand to make my first letter. Then I cut out the outline of the rest of the vinyl words. Afterwards a lightbulb went off , finally I figured out how to apply it. 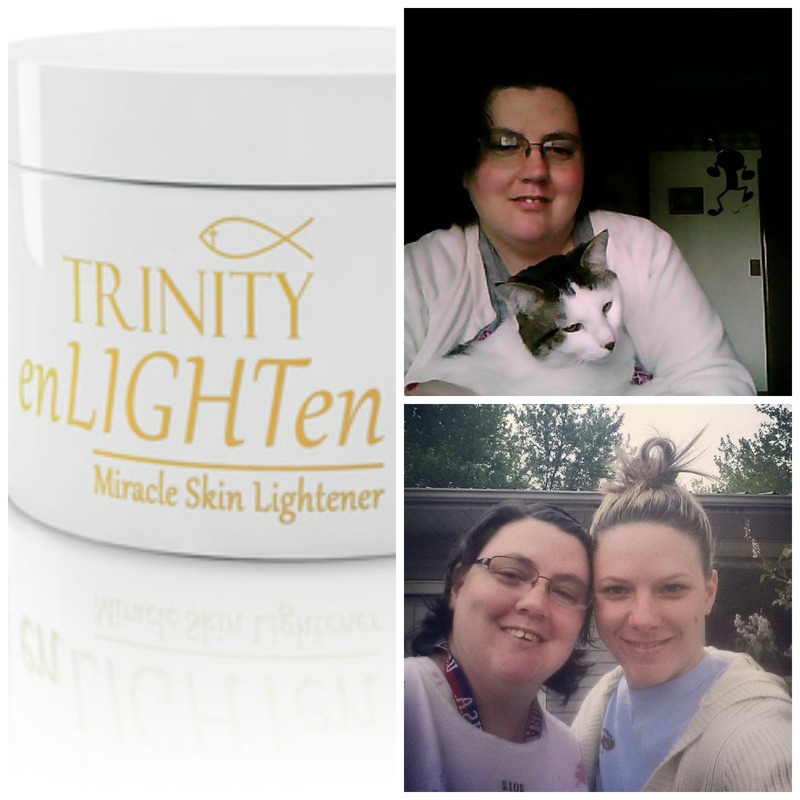 As a member of the CWA Review Crew, I was honored to participate in reviewing Trinity enLIGHTment cream . Most of my adult life I have struggled with uneven skin tone. When I saw that enLIGHTen cream was available to review, I swarmed to it like a bee to a beehive! My experience using the it was phenomenal. The texture of the cream felt luxurious like silk. A little dab goes a long way. It has helped me to get into a routine of better face care. Not only have I seen a difference in my facial tone, but my friends and family have as well. I am more confident about having my picture taken . I am also in love with the aroma of the cream. In life this world doesn’t end when the egg breaks ,sometimes its just the beginning. 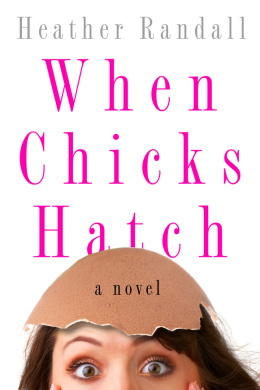 When Chicks Hatch is a masterfully written book filled with faith, hope , love and redemption. Author Heather Randall captivated my attention from the start to the finish of her book. Anyone who needs inspiration minus the preachy feeling should read When Chicks Hatch. Highlighted inside the pages are the lives of five women, whose lives although separately lived, intertwine together. At the heart of each womans story is an element of pain . As I read When Chicks Hatch I felt as if I could see into each womans soul . Love , betrayal, loss , grief and redemption are spread throughout the chapters. I found within the pages that seemingly irredeemable circumstances can hatch into miracles. Imagine living seventeen years with a horrible sense of shame and guilt, without anyone to confide in. Although there is one person who you knows about the accident , but you are already at odds with her. These tragic statements belong to a character inside the book titled Halfa Moon . Author Joan Bannan masterfully draws the reader in from the very first page. After reading the first page I had a hard time putting Halfa Moon down . Meg formerly named Margaret and her brother are kidnapped by their mother from their own home , where they were all three residing with their father. Meg was four and her brother was a baby . She already at the young age of four felt the strained relationship ,between her mother and herself. The pain of feeling responsible for her older sisters tragic death seared Megs heart and haunted her in her daily life. With a nonexistent relationship with her Mother and step father , Meg finds solace in the stepfather Georges Mom. ,whom she lovingly names My Lady. Meg finds love for piano playing and also a refuge within My Lady s home. Inside the pages you find a lot of different scenarios that today’s children, youth and adults are involved with or somehow affected by. Some of them include Drug and child abuse . But are not limited to the two subjects there is also crime and romance. Meg lands a job at a prestigious and highly secure cyber company . She later finds out she replaced an employee who was killed while working for the company. Once again Meg feels her guilt and shame surface after a colleague and friend suffer an attack that was meant for her. A second tragedy caused by Me, were the thoughts that ran through her mind. Throughout the book the characters are all intertwined together into a masterpiece that seems so real. 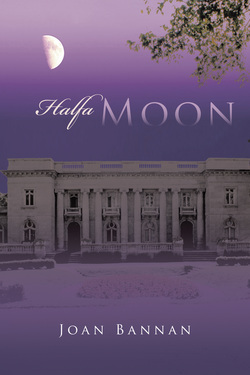 Although I knew Halfa Moon was fiction , the characters seemed to leap off the pages and turn into real people . I was pleasantly surprised at the end of the book. I loved it and didn’t want it to end. Hopefully Joann Bannan will decide to revisit these characters in the future and write a sequel to Halfa Moon! This is book three in the Sonrise Stables series. Evolution vs Creation has been a debate for ages. 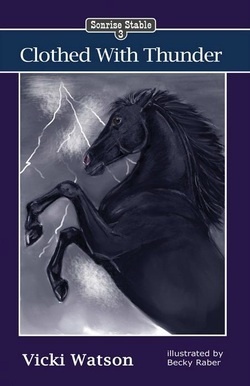 Author Vicki Watson illuminates the creation versus evolution debate masterfully inside her book Clothed with Thunder. Rosie and Carrie attended a 4H club demonstration where a student did a compelling research presentation supporting evolution . After hearing the evolution report, the two girls are determined to create a presentation which will give proof that creation is the true source of how the world was created. Many challenges arose during Rosie and Carries preparation for their presentation. One of the trials included an old adversary who cheated Rosie out of her first trophy with her pony Scamper. Having an old adversary enter their life taught the girls many priceless lessons. I enjoyed reading Clothed in Thunder to my ten-year old daughter. She loves books with horses . The added bonus is it’s a book my daughter and I both agree on and love. I chose to tell the female therapist that I preferred to only work with her. In that moment I didn’t provide a reason or justification for my request. . She honored my decision to only work with her. It felt empowering in that moment to make a direct request without having to give a justification . Where in your life would you benefit from using your voice ? I believe we were given voices to express and empower ourselves! If it resonates with you ,I would love for you to leave me a comment about how you are using your voice or how you plan on using it. So Much The Better is a beautifully written book filled with wisdom, adventure and inspiration. 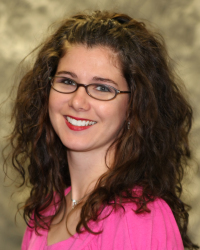 Author Megan Means masterfully composed characters that seem to leap of the pages. I loved how each chapter led into the other evoking a sense of curiosity about what was going to happen transpire. I read So Much The Better nightly to my ten-year old daughter . I love the wonder filled dialogue it facilitated between my daughter and I. Most nights I read more than one chapter because I found it challenging to put the book down. Both my daughter and I were eager to experience more of the phenomenal writing. Imagine you live in a place of peace , security and warmth where each day flows harmoniously into the other one. Then visualize being swept away into a far away land where you are alone and in unfamiliar surroundings. You feel lost and without hope. Ari the small lion cub in So Much the Better experienced these scenarios. He was living a peaceful existence with his Mother and the Lion pride when he was mysteriously swept far away. What if you felt your journey had reached its conclusion and you found out it had only just began? This very thing happened to Ari the Lion . 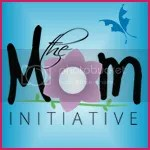 Author Megan Means created a website and social media links to to help get the book’s message out to the world on-line. She also created a Curriculum Companion to the book which is offered for free on her website.It includes 21 lessons on character building that are taken directly from the book to help children become their best selves and inspire them to be great leaders. To learn more about Megan and her book, visit her website: http://meganmeansauthor.com/. You can also find her on Facebook and Twitter. You can purchase your copy of So Much The Better on Amazon or Smash-words.